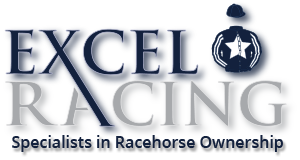 Excel Racing specialises in racehorse ownership, putting together small groups of like-minded individuals to share in the ownership of top quality thoroughbreds. Excel offers a wide range of ownership opportunities from purchasing shares outright to leasing a percentage share. Both options are available on a set, monthly payment plan. Our objective is simple: to make every part of a shareholder’s involvement an exclusive, five star managed experience. As a shareholder you will have your very own racing manager who will keep you fully informed of the welfare and racing plans of your horse. Your personal racing manager will keep in touch via telephone and email, sending photos and videos of your horse’s progress, as well as arranging regular visits for you to watch your horse on the gallops and discuss its progress with the trainer. On all race days a director or senior representative of the Excel Racing team will be on hand at the racecourse to ensure your experience is as enjoyable as possible. Our aim is to reduce the stress of racehorse ownership whilst maximising the fun and excitement of one of the most thrilling experiences of your life. We look forward to welcoming you as an owner with Excel Racing.